I appreciate my fellow bloggers taking the time to review my book, Stepping Stones Along My Journey. "I had been looking for a ladies KJV devotional book for several months when I found Stepping Stones Along My Journey, online. This is a wonderful book for those who are looking for something special. After reading each lesson, I am so inspired. Thanks Deborah for writing a wonderful book." Thank you to Lori Tullis, for writing this review. You can visit Lori at her blog, Frogs Lilypad. My friend, Cathy, at Melodies and Hymnsongs has also written a lovely review of my book. 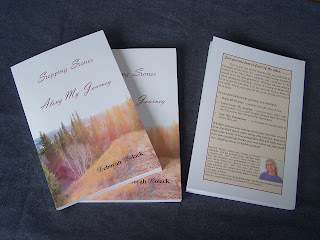 I recently won my friend, Deborah Bolack's pretty book, " Stepping Stones Along My Journey", in one of her giveaways. I have begun reading her very interesting book. Deborah is gifted with words for writing books, poems and songs. I love the way her book is written like short devotionals, and it is filled with scripture from God's Word. In her book, Deb reflects about Stepping Stones to New Life, Golden Memories (including her children), Mercy and Grace, and Steps to Higher Ground. Each page consists of a Title, Pearls of Wisdom (scriptures), and Gems From My Journey ( a writing, poem, or song lyric). Then she includes a question for us to think about. Concluding the page is My New Day Resolution (to the Lord). I believe you will enjoy Deborah's well written, devotional book of treasured memories. I received Deb's book in her giveaway..and what a TREASURE! The personal stories through her journey's are very encouraging. I love the Scripture on each page leaving you with not only her experiences of trusting faith, and lessons of life..but the Word of GOD that coinsides with each story shared. Great easy layout for reading... Read even one story on any given day for a blessing! I also have the songbook and with each song is also a story about why it was written. Very personal and special as the song speaks even more to my own heart. Thank you to all who have taken the time to review my book! I pray that you have found some words of encouragement between it's pages.